This is a very interesting interpretation of the portrayal of the Margaret/Suffolk relationship in the Henry VI trilogy. My feeling is that this pair of lovers combine several contemporary high status pairings that necessarily involved elements of secrecy and political intrigue. Elizabeth and Leicester could well be one of the allusions. I also think that authorship is an issue here, since different authors would have different perspectives on this and related circumstances, and it is quite likely, given the lexical and dramatic variety we find among and within these three texts, that the some of the readings and writings are in competition with each other. I agree, Margaret-Suffolk could represent more than one high status duo. 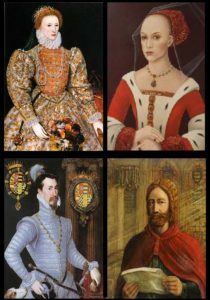 As you might already know, some have suggested the pair mirrors Elizabeth and Jean de Simier, the French diplomat sent to woo her on behalf of the Duke of Alencon. I’m curious how Elizabeth would react to such portrayals. I have my doubts they would always make her happy — Gertrude in Hamlet, for example. I’m fairly sure that Elizabeth would not have been particularly happy with the variously disguised depictions of her in Shakespeare (Richard II and, as you say, Gertrude, are striking examples). Given the level of state intervention in the theatre at the time, it makes me wonder whether Shakespeare was given more license than others to pursue such challenging ideas, and, if so, who would have allowed such license, and why. Tony, thanks for your post. Yes, there’s good evidence that Richard II was censored. Personally, I think the Crown had limits to what it could tolerate from Shakespeare — regardless of whether he had some kind of special license to mock the prince, such as what a court fool might enjoy. Thus I believe Hamlet, after only a few performances, may have been banned and only resurfaced after Lord Burghley (Polonius) and Elizabeth (Gertrude) were dead. I would think that Elizabeth’s Privy Council was involved in deciding when a playwright went too far. We know, for example, that the Privy Council shut down Isle of Dogs, a play by Ben Jonson and Tom Nashe. Unfortunately, the play is lost. Elizabeth might have ordered every copy burned!